Lura Barber is a proud Midwesterner who moved to DC in 2010 to—what else?—pursue her love of comedy. She began taking classes at Washington Improv Theater a year later, and hasn’t looked back since. Before joining Nox! she was a member of indie troupe Pony! Poni! Pone! (co-founder), and currently performs with all-woman supergroup Sweater Kittens (while dreaming of reuniting with her FIST teams, Prom Committee and The Chaff). Lura has workshopped with instructors from Magnet Theater, Deanna Fleysher, Jimmy Carrane, and others, and recently joined the WIT faculty as a TA. She hopes to perform improv until they pry the invisible gun from her cold, dead fingers. 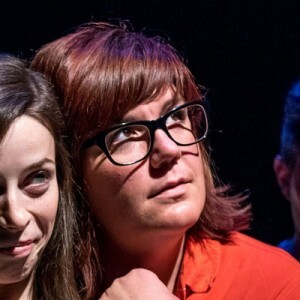 Lura pushes students to connect honestly with their scene partners, to make bold, smart character choices, and to have as much fun as humanly possible on stage. She believes in playing to the top of your intelligence, unhinged physical humor, and building an inclusive improv community. These are just a few of her favorite things. Lura is a member of WIT house ensembles Nox! and October Issue, as well as Beverly Crusher, champion of the 2016 Fighting Improv Smackdown Tournament, and has appeared in the San Diego Improv Festival, Philadelphia Improv Festival, WIT’s Improvapalooza, and the District Improv Fest. Lura has trained at WIT, studied vocal performance at the Old Town School of Folk Music in Chicago, and played Mother Superior in her high school’s production of The Sound of Music. I'm not here to win; I'm here to make friends.